I am curious if you have a take on the BOJ. They own almost all of the JJB market and have stated explicitly they will buy it all. Now they own 77% of the Japanese ETF market. Is it folly to suggest that the US gov’t or FED is not doing the exact thing? Case in point, I know no one in managed money that is stupid. So, this morning why were stocks panic bid in the face of horrid payrolls and an all out bloodbath with China, especially considering that valuations are extreme. That was not delta hedging. Have equity markets become weaponized for economic policy? ANSWER: The Fed is nothing like the Bank of Japan (BoJ) or even the ECB. In the case of Japan, their debt has always been primarily held domestically. You could not issue even a private note in Japanese yen without prior approval of the Ministry of Finance. Japan has maintained a controlled economy. The ECB has followed that direction. It is illegal to short Eurozone bonds. In both cases, they believe if they control the financial markets they can prevent a crash and this supports the political agenda. The Fed is NOT reinvesting its bond purchases. When they mature, the balance sheet will be reduced. Always people bash the Fed and attribute what the BoJ and ECB do assuming the same will take place at the Fed. This is just not true. 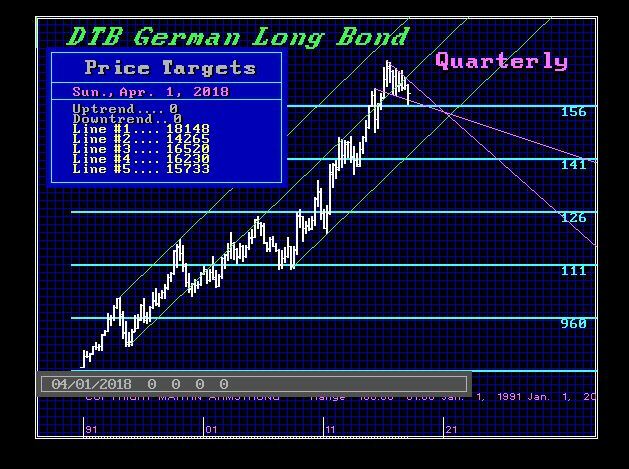 We just obtained the lowest quarterly closing on German bonds since the major high of June 2016. The trend is slapping us in the face yelling – wake up you fool!